Real estate is the largest asset class in the world. But, in contrast to other major asset classes, it does not have well-developed derivatives markets, despite their potential benefits. In this post I present the results of my research that investigated the potential effects of property derivatives trading on housing demand, house price volatility and housing bubbles; provide an overview of historical developments in the property derivatives markets; and discuss the barriers to the growth of these markets. What is a property derivative? A property derivative is a financial instrument whose value is derived from the value of an underlying property price index. Property derivatives can be categorized into four main types: futures/forwards, options, swaps and structured notes. Although there have been several initiatives to launch property derivatives markets and several varieties of property derivatives products have been developed and traded in the last two decades, especially in the United Kingdom and the United States, property derivatives trading is still at a nascent stage. However, well-developed property derivatives markets could provide many benefits and help to overcome the main drawbacks of direct property investments. A well-functioning derivatives market is composed of both hedgers and speculators. Real estate developers, real estate investors, mortgage lenders and owners are the potential hedgers, whereas speculators could include hedge funds, pension funds and individual investors. In residential property derivatives markets, homeowners are, in principle, natural hedgers due to their housing exposure. But in the last decade, the development of residential property derivatives markets has lagged behind commercial property derivatives markets. This has cast doubt on the extent of the demand for hedging products by homeowners – especially as owning a house may provide a self-hedge, as argued by Sinai and Souleles (2005). However, this self-hedging mechanism is imperfect due to the ability of owners to trade up and down, and/or move to different geographical housing markets, in which the house prices are not perfectly correlated. The existence of a property derivatives market would therefore allow homeowners who are planning to trade-up (down) to hedge the difference in the value of their future house and their current house by taking a net long (short) position in property derivatives. Furthermore, when a house is owned solely for investment purposes, there is no role for self-hedging. Such investors will be exposed to investment risk as with any other financial asset; therefore they can use property derivatives to hedge against their housing investment risk. Finally, prospective first-time buyers could be one of the main household groups that could benefit from trading property derivatives, either by taking long positions in property derivatives or by investing in capital-guaranteed bonds to save for a down payment. Empirical evidence from Sweden (Englund, Hwang, and Quigley (2002)), the United Kingdom (Iacoviello and Ortalo-Magne (2003)), and the United States (Bertus, Hollans, and Swidler (2008)) suggests that households could have benefitted from a well-functioning property derivatives market. Although it is unlikely that many households would participate directly in a property derivatives market, they could benefit through retail products such as house price index deposit accounts and/or insurance products against house price decreases. Such products could be offered by banks and insurance companies, which would participate in the property derivatives markets directly to hedge against their exposure. Although housing is one of the largest asset classes in the world, the housing market is imperfect due to its illiquid and lumpy nature, high transaction costs, short-sale constraints and the absence of financial instruments that would permit investors to hedge their exposure to house price risk. Moreover, housing has the dual role of providing a flow of consumption services and being an investment asset. When households’ optimal consumption and investment decisions do not coincide, either their housing consumption or investment choices become distorted. In Uluc (2015) I develop a theoretical model to investigate the effects of property derivatives trading on housing demand, house price volatility and housing bubbles, through its ability to facilitate the separation of housing consumption decisions from housing investment decisions, and to solve some of the imperfections in the housing market by facilitating short-selling, hedging and speculation. I applied the De Long, Shleifer, Summers, and Waldmann (1990) model of noise traders to the housing market. The risky asset is housing in this case. This adds new features to the model as households receive utility from housing services and cannot short-sell houses. The existence of noise traders in the housing market creates uncertainty about house prices, causes prices to deviate away from their fundamental values, and leads to a distortion in housing consumption. To investigate the impact of property derivatives trading on the housing market I introduced a new financial instrument, housing futures, into the baseline model. Housing futures trading affects house price stability through three mechanisms. The first mechanism is its ability to enable households to disentangle their housing consumption decisions from housing investment decisions. The second mechanism is the short-selling opportunity provided by housing futures trading. The third mechanism is that it attracts pure speculators looking for portfolio diversification opportunities. My analysis shows that, for a large set of admissible parameter values, housing futures trading stabilises house prices and increases the welfare of households and investors. The two key assumptions behind these results are that: (i) noise trader (sophisticated) households are always relatively optimistic (pessimistic), and (ii) the share of pure speculators that are sophisticated is higher than the share of households that are sophisticated. As shown in Uluc (2015), housing futures can be effective in solving the imperfections and distortions in the housing market, and play a role in stabilizing house prices and dealing with housing bubbles. Although property derivatives markets are still at a nascent stage, several initiatives have been undertaken to enhance well-functioning property derivatives markets. In the United Kingdom the first property derivatives market was introduced in 1991 although, until 2005, property derivatives traded only occasionally and trading volumes were very thin (Syz, 2008). Volumes took off between 2005 and 2008 following the removal of regulatory and taxation obstacles, and also the founding of the Property Derivatives Interest Group (PDIG), a part of the Investment Property Forum, which improved the awareness of the market. Similar gains in momentum were also seen in the United States, Europe and Asia during that period. However, property derivatives markets started to struggle in 2009/2010 as a result of turmoil in the banking and property sectors, and volumes have continued to decline since then. 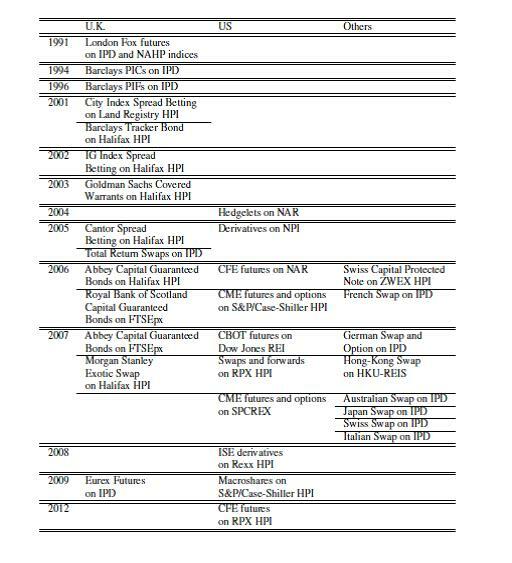 Table 1 provides a summary of historical developments in the property derivatives markets in the United Kingdom, the United States, Europe and Asia. A number of factors have held back the development of the property derivatives markets, despite its potential advantages. First has been the lack of consensus on, or the establishment of, an appropriate index, which can be used as an underlying instrument for derivatives. Other obstacles included a lack of sufficient pricing models, a lack of liquidity, a lack of a secondary market, a lack of education and acceptance among potential users, and legislative uncertainties and impediments over the treatment of property derivatives. Arzu Uluc works in the Bank’s Macro Financial Risks Division. Next Post Will there really be a pensions spending spree?